We are huge foodies and it is one of our favourite things about travelling. We also love to immerse ourselves in the culture of the country we are visiting and learn as much as possible about that country. 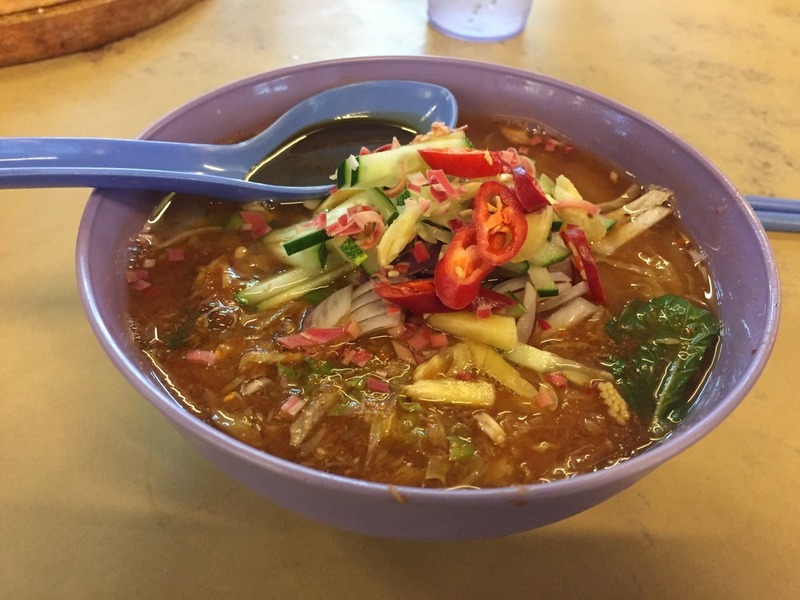 A food tour by Simply Enak in Georgetown, Penang adds those two things together to give a super introduction to the island. We tasted foods we had never tried before, learned many interesting historical and cultural facts and even talked Malaysian politics. We did our first ever food tour with Mark from Simply Enak in Penang which perfectly combines tasting delicious local foods with learning about the city’s culture, history and way of life. Mark is completely unscripted and adapts the tour to suit the group. It is like hanging out with a good friend who is super passionate about food. Best of all, the tour is completely family-friendly and the kids loved trying all the new foods and hearing interesting cultural stories. 4 Is a Food Tour Kid-Friendly? 6 Is the Tour Suitable for Vegetarians? 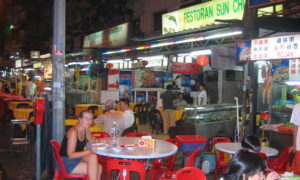 Penang is renowned as one of Asia’s great street food cities. But it can sometimes be intimidating to know what to order, how to order it and even to try to figure out what it is you are eating. 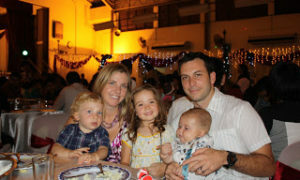 We had previously lived in Malaysia and are fairly familiar with the most popular dishes. We tend to order the same few favourite things wherever we go and don’t always try new things. On a food tour you are encouraged to sample and try everything and we discovered lots of new foods that we really enjoyed. Since the tour winds history, culture and food together, we also learned so much more about Penang, its people and way of life. After doing the Penang Harmony Food Trail with Simply Enak, I can definitely understand why they have such stellar reviews on Tripadvisor. Our tour guide, Mark is born and bred in Georgetown and he tours you through the heritage quarter, where he grew up. I loved how Mark adapted the tour to suit us vegetarians and to suit kids, with lots of less spicy options. He is clearly passionate about food and takes you to his favourite spots, off the tourist trail. We also really appreciated learning about the clans of Georgetown, the temples, the cultural makeup of the country and its food influences. As we walked around sampling foods in our little group, we became fast friends with the other guests and Mark. Mark was really open about sharing his opinions and thoughts on his country and city and we felt comfortable asking him about everything we were curious about. Finally, the food. That is why you pick a food tour and there was plenty of it on our tour. The Harmony Trail Food Tour starts at 8:30 (before it gets too hot out) and we made 4 stops where we sampled many dishes. We walked about 3 km throughout the 3.5-4 hour tour, at which point our bellies were very full. Our first stop of the day was an Indian restaurant for breakfast of puri and potato curry, dosa with coconut chutney, utta pam, vada donuts and chai. The kids and adults gobbled up the delicious food while Mark explained the differences between each of them and how they are made. While we were waiting for the food, Mark pulled out an ipad and explained the history of the island of Penang and where its inhabitants originated. While I was already familiar with the Malay, Chinese and Indian heritage of Malaysia, I found it fascinating to learn about which regions of India and China migrants came from and the negotiations between the Sultan and the British over Penang. In between food stops, we visited a number of temples as Mark took us down Harmony Street. This is the street that was the focus of the UNESCO Heritage Site application as it houses a church, mosque, Chinese temple and Indian temples within close proximity. We learned how the Chinese use oracle sticks at the temple, the roles the clans of Georgetown played in everyday business and how more recently tourism has gentrified the once seedy old town. Our next stop of the day was for roti canai and appam at an Indian Muslim street stall. Here we tasted delicious roti canai with dhal and chicken curry (for the meat eaters) and appam with very wobbly eggs. We talked about the recent Malaysian election and why the country is hopeful for change. I loved how Mark adapted the tour as we went. 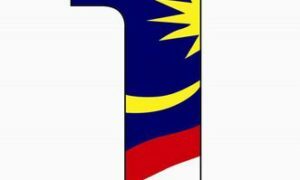 We stopped at a car with a Dato license plate and Mark explained what the Dato title means (similar to Sir or Lord) and how a person achieves that title. After stuffing our bellies with roti, we continued along until the torrential rain hit. Mark quickly led us into a nasi kandor restaurant to escape the rain. Lucky for us, it was Friday and the huge pot of biryani was just coming out. I have never tasted biryani that was so fragrant with carmelized onions and delicious spices. Mark explained that “nasi kandor” refers to the food the Indian Muslim traders ate, with nasi meaning rice and kandor referring to the poles used to carry the vats of curry. Nasi kandor is very popular in Penang and you will see nasi kandor restaurants all around town. We also had some local iced lemon tea and some meat curries. Our last stop of the tour was a Chinese food stall where we sampled some delicious char kway teow, my favourite dish in Malaysia. The meat eaters in our group also had the opportunity to taste some famous pork dishes. Mark introduced us to a new drink made with nutmeg, that was really tasty and refreshing. By then our bellies couldn’t take any more and the tour wound to an end. Is a Food Tour Kid-Friendly? 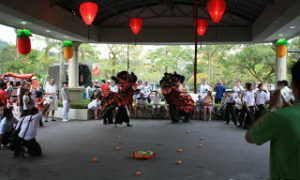 Since it is a small group tour, it can be adapted to suit the group. Mark asked about dietary restrictions in advance and when we started ensured there were lots of non-spicy options for the kids to try. Our kids tried many more foods than they normally would and asked lots of questions. A food tour can include a lot of walking, but the pace was suitable for kids with frequent stops to eat and see sights. If travelling with little kids, bring a carrier as Georgetown’s streets are not conducive to using a stroller. Pricing wise, the cost for kids 4-11 years old is only 50 MYR. Tours are offered in the morning and evening and are 3-4 hours long. You will be doing lots of walking, which is a great way to walk off the food you will be eating. Bring comfortable walking shoes and be prepared for rain as the tour goes in all weather. Our meeting spot was St. George’s Anglican Church, which is in the Georgetown UNESCO heritage zone. Mark paces you to ensure you don’t fill up too quickly. Tours are small group tours, priced at 250 MYR+/person ($80 AUD). There is plenty of food and drink on the tour and since our tour went from 8:30 am – 12:30, it was our breakfast and lunch. Is the Tour Suitable for Vegetarians? Asian food can be tricky for vegetarians since small amounts of meat are added to most dishes and meat stock and lard are used frequently. Mark adapted our tour to include more Indian foods like roti canai, poori, appam and biryani since it is harder to eat vegetarian at Chinese restaurants. You can definitely do the Simply Enak tour as a vegetarian, just make sure you let them know when you book. We usually do self-tours of a city where we wander around using a guidebook or tourist map. The Harmony Trail Food Tour experience with Simply Enak completely enriched our visit. We learned so much more than we could have from just a guidebook. Mark shared stories of his childhood growing up in Georgetown, his opinions on the current state of Malaysia and the influences of Malaysian food. He taught us about the history and culture, but with a refreshingly personal spin. It really was like hanging out with a good friend and we really appreciated that casual feel of the tour. As for the food, we are fairly familiar with Malaysian foods, but we often order the same things over and over again. Mark wanted us to try lots of new things and we definitely came away with some new favourites. As a born and bred Georgetown resident, Mark took us to the best of the best: little eateries and street stalls tucked down alleys, that we wouldn’t have found on our own. Mark’s passion for food was infectious and the look of glee on his face when our foods arrived was evidence of his passion. We had no idea we would love an organized food tour so much. Our tour with Simply Enak was definitely one of the highlights of our time in Penang and was a great way to learn about Georgetown’s history, culture and food. Disclaimer: We were hosted on the Harmony Trail Food Tour by Simply Enak in exchange for our honest review. As always all opinions are our own. What a great and immersive experience. The perfect way to familiarise yourself with a culture! It really was! I expected to learn about the food, but had no idea I would walk away learning so much about the history and culture of the island. Thanks Cat. Penang is one of my fav destinations ever and food is certainly one of the reasons why!